Asics’s marketing pitch: Cushioned and lively with each step. Upper: Spacer mesh, fused layers. Midsole: Combination of Flytefoam and EVA foam midsole, visible Gel under the heel and concealed forefoot Gel. 10 mm heel drop. The Asics GT 2000 6 gets a Flytefoam midsole and a no-sew upper. The ride is more balanced than the GT-2000 5 and the upper fit gets better. It’s surprising how long it took the GT-2000 to jump on the Flytefoam wagon. The Kayano and Nimbus got their Flytefoam midsoles a year ago, along with others like the DS-Trainer. For those of you who’re hearing of Flytefoam for the first time, it is a new foam developed by Asics. It has an EVA (Ethylene Vinyl Acetate) base, but is mixed with fibers to produce a material which is lighter and more resilient than standard foams. 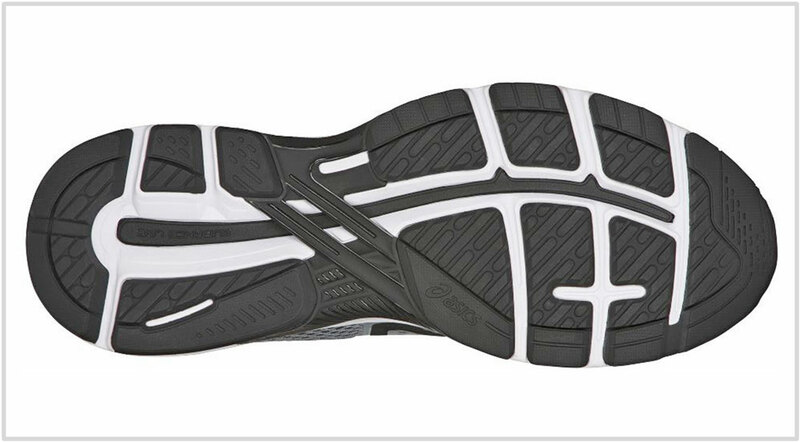 Along with a midsole which is partially Flytefoam, the GT-2000 6 is redesigned from the ground up. This means that the GT 2000 receives a brand new upper, midsole, and outsole. You can’t redesign an entire shoe without having an impact on the upper fit and ride quality. As a result of the changes, the GT-2000 6 has a more supportive ride. The upper gets a wider forefoot and a shallower toe-box. 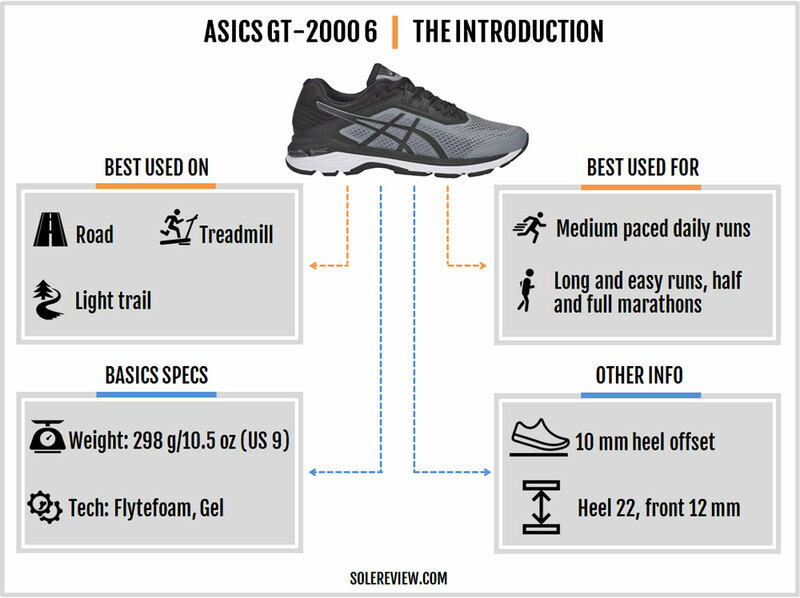 Thanks to Flytefoam, the GT-2000 6 is also lighter than the V5 by a half-ounce. 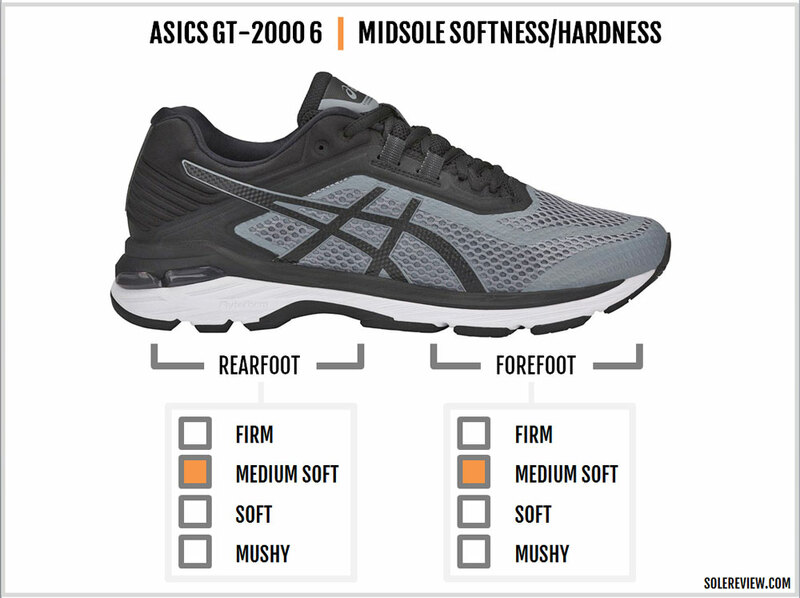 The GT-2000’s cushioning has always occupied the sweet spot between firm and soft, and that doesn’t change this year. However, the new Flytefoam layer makes the V6 a bit firmer than before. If you recall, Flytefoam had the same effect on the Kayano and Nimbus too; the new foam is denser and more resilient as compared to Asics’s legacy foam material. But the update to the GT-2000 6’s ride character isn’t just due to Flytefoam. 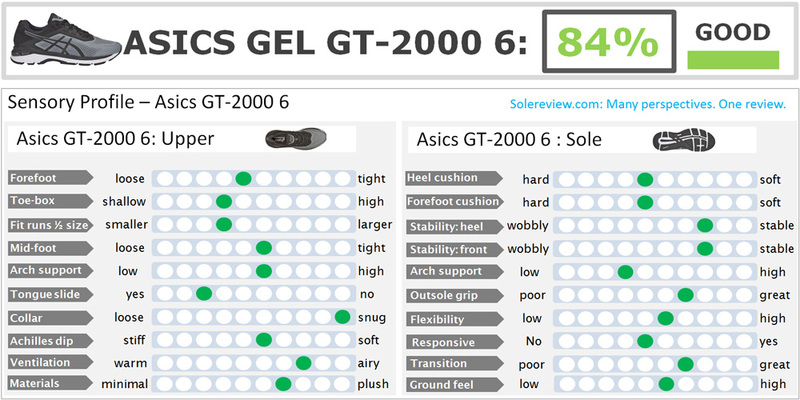 There are two other changes which make the GT-2000 6’s midsole firmer and more balanced than the 5. In the past, the outer midsole had a large visible-Gel pad placed horizontally. Since the inner midsole has the firmer medial post called the Duomax, the softer Gel side led to a cushioning bias. On the GT-2000 6, not only is the visible Gel pad smaller, it is angled upwards. This redesign makes the outer midsole slightly firmer at heel strike. Hence, the midsole is better balanced. A better way to describe the V6 is that the latter is a more neutral version of the V4 and V5. Also, the heel midsole feels more centered. This happens because the ‘Guidance line’ exposes the upper midsole all the way from the heel to the toe. On the V5, the Guidance line exposed the upper foam layer only from the midfoot onwards. The revised under-heel design makes the V6’s midsole splay better under the heel. In other words, the exposed Guidance groove helps center the weight better than the V5. Asics does a great job of integrating the medial post into the midsole. It does not feel intrusive or felt as a separate foam wedge under the arch. The upper midsole layer (non-Flytefoam) acts as a barrier between the arch and the hardness of the medial post. The forefoot has a firmer ride than the GT-2000 5. Though there’s ‘Gel’ inside, know that it’s a dime-sized piece which has little effect on the cushioning. Any immediate softness felt is a result of the blown foam insole placed over the midsole. The Flytefoam makes the forefoot firmer and increases the break-in period. The GT-2000 6 needs to go through 30 miles or so before the forefoot breaks in. Once the bed-in process is complete, the GT’s forefoot ends up being moderately flexible. On the other hand, Flytefoam makes the forefoot feel more consistent. The V6 uses a similar outsole layout which consists of a plastic midfoot shank and rubber lugs divided by flex grooves. In the past, the edges of the rubber slabs could be felt under the forefoot. The firmer Flytefoam offers improved insulation from the outsole slabs. ‘Responsive’ isn’t a term we associate with Flytefoam. But for whatever it’s worth, the GT-2000 6 is more responsive than the V5. The exposed Guidance line under the heel creates a splaying movement which is akin to responsiveness. The fiber-rich Flytefoam also has more ‘life’ than standard EVA foam. 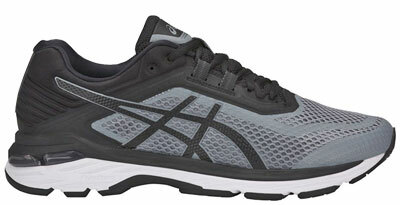 The Asics GT-2000 6 is good for daily runs and long distance races. Though we’ve used the word ‘firm’ many times while describing the GT’s ride, please know that it’s purely in a comparative sense. The GT is softer than shoes like the Saucony Guide and the Nike Structure. The removable foam sockliner delivers a soft under-foot feel while the combination of the foam lasting and the dual-density midsole provides the rest of the cushioning. The blown rubber forefoot outsole also muffles forefoot strikes and transitions. 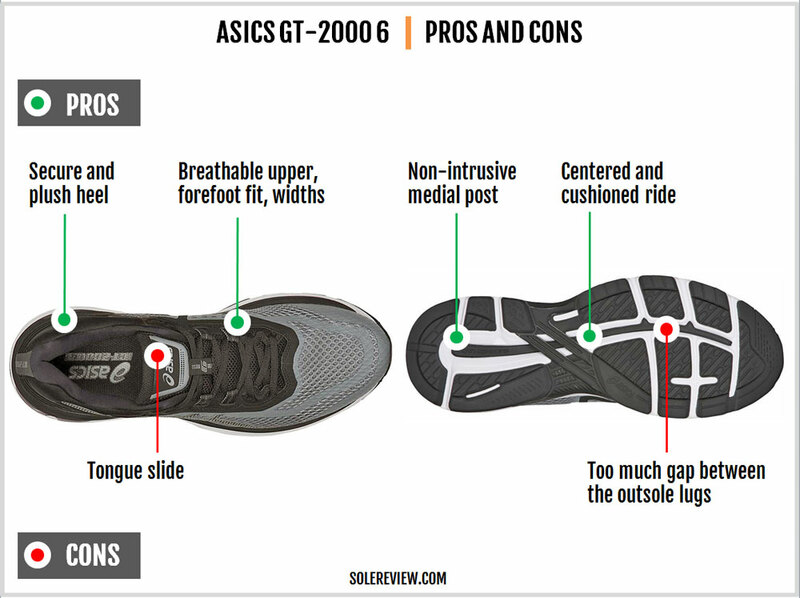 The heel ‘Guidance Line’ and the split crash pad also augment the cushioning experience. Our opinion is that the V6’s ride quality is a marked improvement over the V5. The ride is more balanced on both sides with reduced cushioning bias. The shoe is lighter by half an ounce too. That said, the GT feels a bit bottom heavy as compared to the last year’s model due to the lighter upper construction. The GT has gender-specific cushioning. The Women’s GT-2000 6 has a stack height which is lower by 1 mm and the top midsole layer is softer than the men’s version. The GT-2000 6’s upper comes with a slew of changes, both fit and aesthetic related. The synthetic and thick fused overlays last seen on the V5 are now replaced by thinner, hot-melt layers. 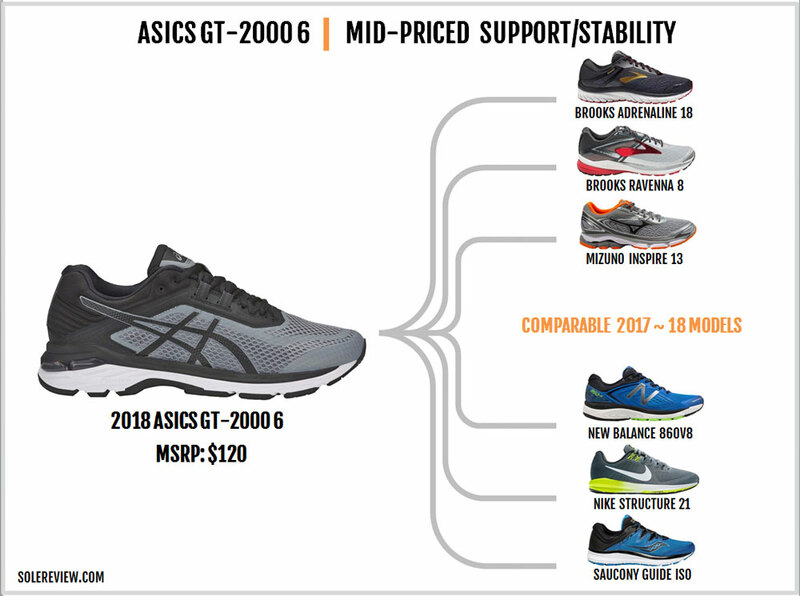 According to Asics, the GT-6 also uses a brand new last for its upper. The toe-bumper is now stitch-less too. As a result, the toe-box loses a bit of height. The relative shallowness of the toe-box isn’t just due to the bumper. The V6’s heel has been designed that it curves inwards more than the V5. The outer heel clip is now replaced with an internal counter, along with a change in the heel lining material. 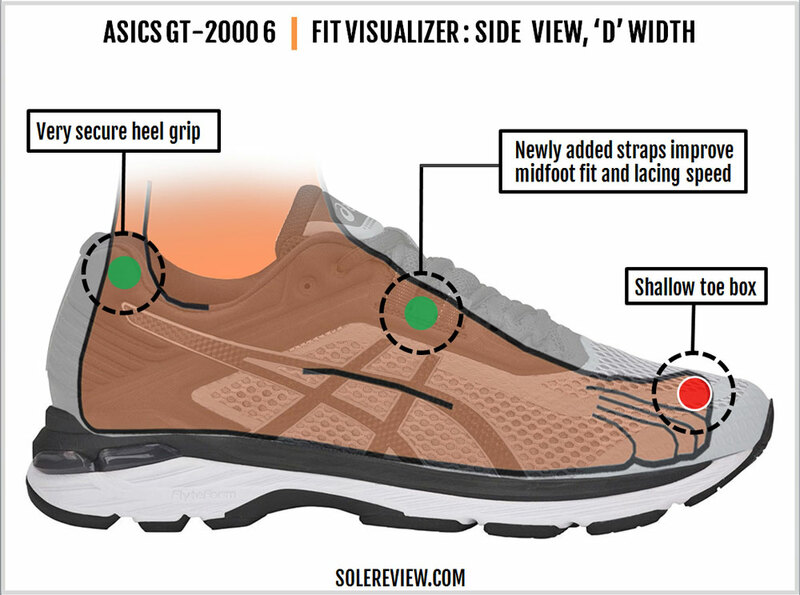 So while the heel grip improves a lot over the V5, the inward curve tends to move the foot forward, hence reducing the amount of toe-box space available. A side effect of this update is also a slightly shorter sizing. This amounts to a reduction of nearly 1/3rd of a size versus the GT-2000 5. However, the forefoot fit is another story. Getting rid of the thick Asics logos on the side frees up forefoot room. The lacing also begins further away from the toe-box as compared to the V5. 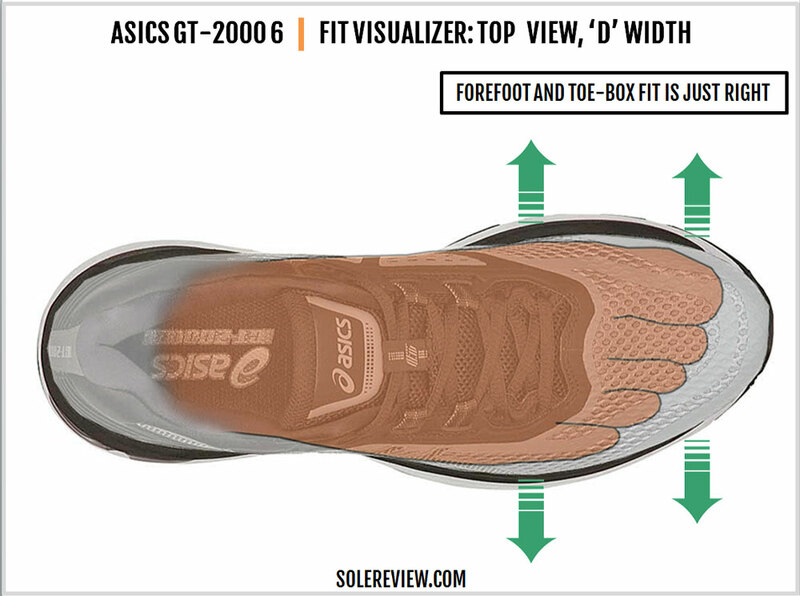 Both these factors combine to create a more relaxed forefoot fit. Breathability is better this year. That’s due to the slightly thinner spacer mesh and the inner midfoot which has a vented panel. Instead of the Asics logo, the medial upper has a fused panel with perforations. This feature helps with air circulation. Lacing the midfoot is faster than before thanks to the twin speed-lacing loops. These straps help cinch the midfoot better as well. There’s no remedy for the tongue slide, though. Given the lack of a gusset or sleeve, the GT-2000 6’s tongue will move around. There are no red flags in the V6’s design. As a result, you’ll get around 400 miles out of the shoe. 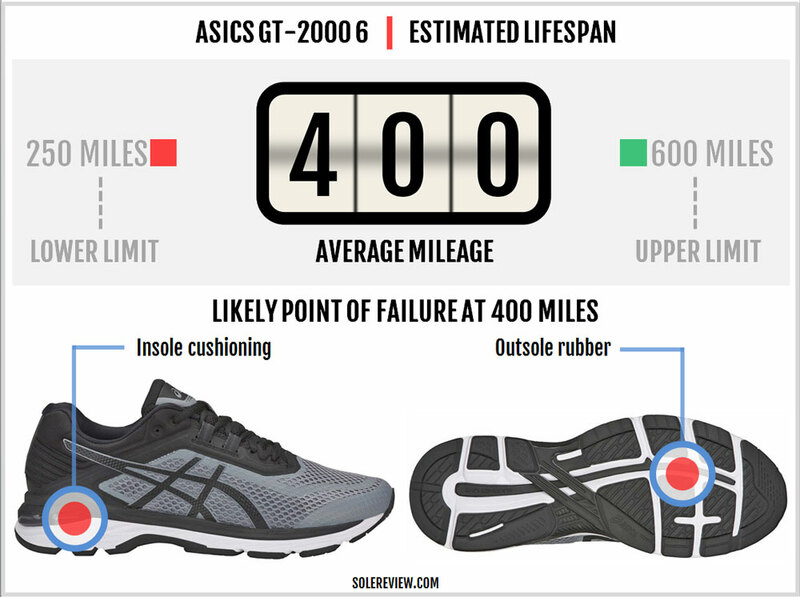 The midsole uses Flytefoam so it will retain its cushioning longer than previous versions of the GT-2000. There are a few things which we don’t like about the GT-2000 6. The tongue slide is a minor annoyance, and so is the inconsistent sizing when compared to the V5. Though the Guidance line isn’t as noticeable as before, it would make more sense to make it narrow under the forefoot. This will prevent the outsole edges from being felt underneath. On the list of positives, count the relaxed forefoot fit, the availability of multiple sizing widths, the ultra-secure heel grip, and ventilation. The midsole balances the inner and outer midsole extremely well, thus making the V6 more supportive than the V5. SHOULD I UPGRADE OR DOWNGRADE? An MSRP upcharge of $40 will get you the Asics Kayano 24. It’s a plush version of the GT-2000, although not necessarily more supportive. Buy the Kayano only if you crave a more cushioned ride and upper plushness. The GT-1000 6 is a budget GT-2000. While the 1000 6 uses better materials than the 1000 V5, the overall material specs are lower than the GT-2000. The midsole is a non-Flytefoam type with a single-density forefoot. 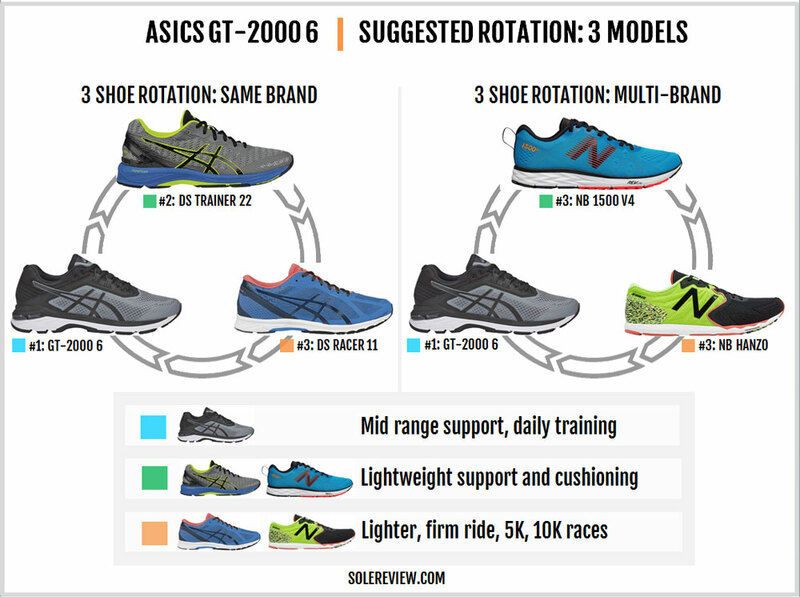 Complement the GT-2000 with a lightweight trainer and a race-day shoe. 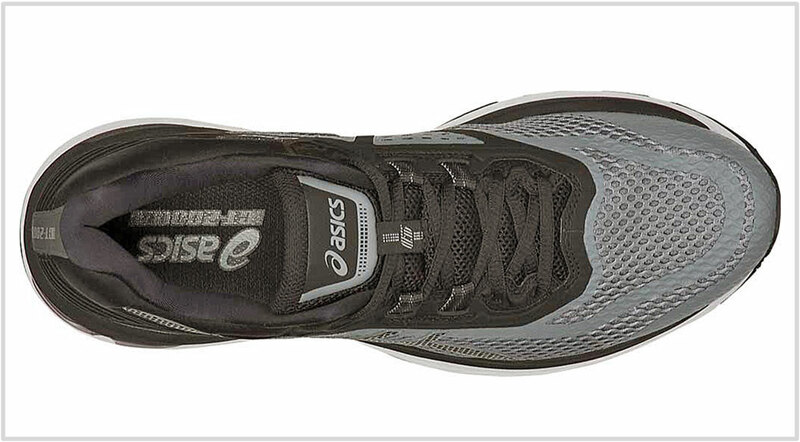 The Asics DS Trainer 22 is an excellent lightweight shoe for fast training runs or races of up to a half marathon. At the time of writing this review, Asics lacks a thoroughbred racing flat. The DS Racer 11 has been discontinued, but it is still available in a lot of places so we’ll include it here. The New Balance 1500V4 is a great lightweight trainer which compares with the DST-22. For 5K and 10K races, models like the New Balance Hanzo, adidas adios 3, or the Mizuno Wave Ekiden will do great. 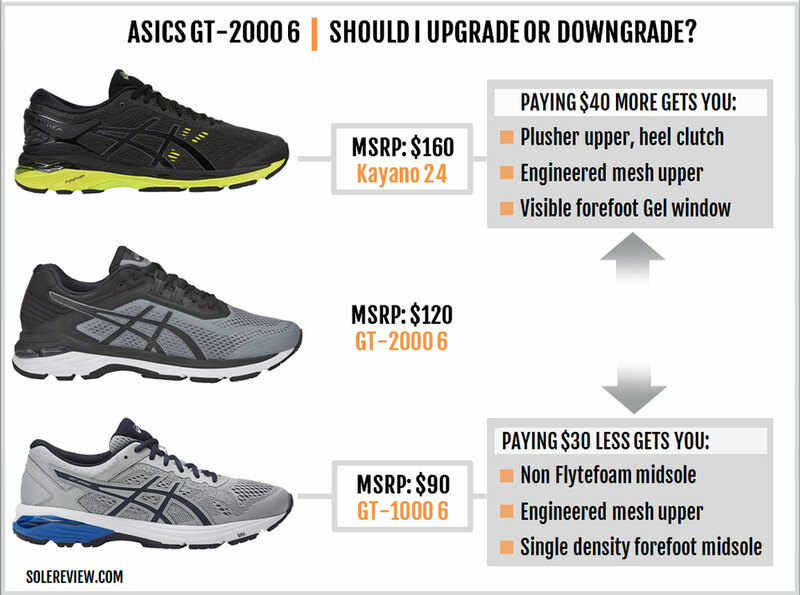 If you’re still deciding on which support shoe to buy, here are some buying tips. We suggest that you also look at the Brooks Adrenaline GTS 18, the New Balance 860V8, or the Saucony Guide ISO. 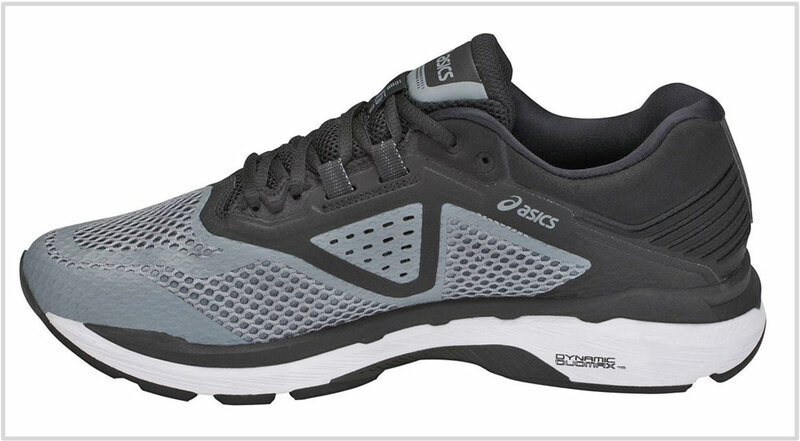 All three are stability shoes with medial posts and comparable levels of cushioning. The Adrenaline and New Balance 860 are softer than the Guide, though. For an even firmer ride, consider the Nike Structure 21. It’s got a responsive forefoot and a very firm rearfoot with a medial post. For a cushioned ride with mild stability, try the Mizuno Wave Inspire 13 or the Brooks Ravenna 8.